For the politician, see Larry Hughes (politician). One of the most heralded basketball players to come out of St. Louis, Hughes started his basketball career at Christian Brothers College High School (CBC), which won the Missouri state championship in 1997. He also led the St. Louis Eagles to an AAU National Championship, the summer prior. He played in the 1997 McDonald's American Game scoring 21 points. Christian Brothers College High School is a Lasallian Catholic college preparatory school for young men in St. Louis, Missouri. It is located in the Roman Catholic Archdiocese of Saint Louis and is owned and operated by the De La Salle Christian Brothers Midwest District. Hughes played 1 season of college basketball at Saint Louis University. He finished the 1997–98 season with per game averages of 20.9 points, 5.1 rebounds, 2.4 assists, and 2.16 steals. He led the Billikens to the NCAA Tournament that year, making it to the second round after a win over University of Massachusetts. 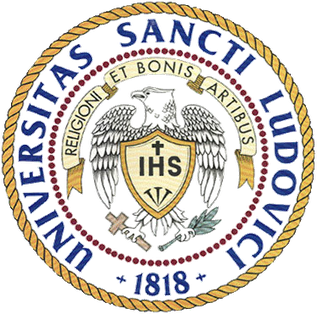 The Saint Louis Billikens men's basketball team is the intercollegiate men's basketball program representing Saint Louis University. They compete in the Atlantic 10 Conference. The head coaching position is currently held by Travis Ford. Chaifetz Arena is home to the Billikens. The Billikens have reached the championship game of the NIT tournament four times and have won it once (1948). They have appeared in the NCAA Men's Division I Basketball Tournament ten times, most recently in 2019. Each year, the Billikens play Atlantic 10 rival University of Dayton for the rights to the Arch Baron Cup. Saint Louis holds an overall record of 25–29 in the Arch Baron rivalry. Hughes participated in the 2000 Slam Dunk Contest in Oracle Arena (home of the Golden State Warriors) in Oakland, California. Hughes signed a five-year $70 million contract with the Cleveland Cavaliers as a free agent in the summer of 2005. He was brought into Cleveland to provide assistance to young superstar LeBron James, the Cavs' first overall draft pick in 2003. In the 2005–06 season he helped LeBron and the Cavs to an 18–10 record before requiring surgery on his broken finger. His last performance before the injury came in a 97–84 home upset of the Detroit Pistons, in which he scored 16 points on 7–10 shooting to go with two steals, five rebounds and three assists. Prior to injuries in 2005, he averaged 16.2 points, and 37.6 minutes per game. Both of those statistics were the second best on the team, to LeBron James. He has an ongoing rivalry with former backcourt partner Gilbert Arenas, with whom he played for three seasons, two in Washington and one in Golden State. Gilbert Jay Arenas Jr. is a former American professional basketball player. 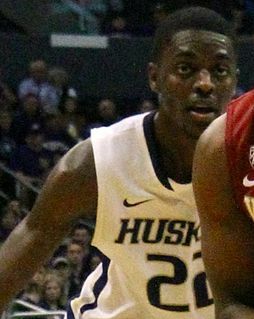 Arenas attended Grant High School in the Valley Glen district of Los Angeles, and accepted a scholarship offer to the University of Arizona late in his junior year. He entered the 2001 NBA draft and was selected in the second round by the Golden State Warriors. On May 2, 2006 Hughes was recipient of the inaugural Austin Carr Good Guy Award, designed to recognize the Cavaliers player who is cooperative and understanding of the media, the community and the public. Delonte Maurice West is an American former professional basketball player who played in the National Basketball Association (NBA) for the Boston Celtics, Seattle SuperSonics, Cleveland Cavaliers, and Dallas Mavericks . He also played professionally for the Fujian Xunxing and Shanghai Sharks of the Chinese Basketball Association and the Texas Legends of the NBA G League. Prior to playing professionally, West played college basketball for Saint Joseph's University. Andrew Melvin Gooden III is an American former professional basketball player who is a sports broadcaster for NBC Sports Washington. The power forward played 14 seasons in the National Basketball Association (NBA). Gooden played college basketball for the Kansas Jayhawks, where he was a consensus first-team All-American in 2002. He earned NBA All-Rookie First Team honors with the Memphis Grizzlies after they selected him in the first round of the 2002 NBA draft with the fourth overall pick. Keith Ramon Bogans is an American former basketball player currently working as an assistant coach for the Westchester Knicks of the NBA G League. He played college basketball for Kentucky. John Rashall Salmons is an American former professional basketball player who last played for the New Orleans Pelicans of the National Basketball Association (NBA). He played college basketball for the University of Miami. Anderson França Varejão is a Brazilian professional basketball player for Flamengo of the Novo Basquete Brasil (NBB). A 13-year NBA veteran, he spent the previous 12 seasons with the Cleveland Cavaliers, where he was a fan favorite and endeared himself to his teammates with his hustle. Varejão is also a regular member of the Brazilian national team, winning a gold medal in 2003 at the Pan American Games. Dahntay Lavall Jones is an American former professional basketball player who last played for the Cleveland Cavaliers of the National Basketball Association (NBA). He played college basketball for Rutgers and Duke. In 2016, he won his first NBA Championship with the Cavaliers. 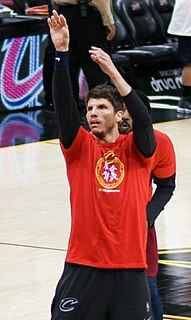 Aleksandar "Saša" Pavlović is a Montenegrin former professional basketball player who spent ten seasons in the National Basketball Association playing for the Utah Jazz, Cleveland Cavaliers, Minnesota Timberwolves, Dallas Mavericks, New Orleans Pelicans, Boston Celtics and the Portland Trail Blazers. He also represented Serbia and Montenegro national basketball team internationally. Standing at 6 ft 7 in (2.01 m), he played at the small forward and shooting guard positions. 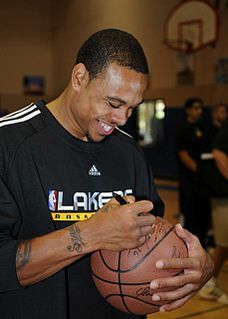 Shannon Brown is an American professional basketball player. He attended Proviso East High School in Maywood, Illinois, was named Illinois Mr. Basketball in 2003, and played college basketball for Michigan State University. He was drafted by the Cleveland Cavaliers with the 25th overall pick in the 2006 NBA draft. James Edward "JJ" Hickson, Jr. is an American professional basketball player. He played one season of college basketball for North Carolina State University before being drafted 19th overall by the Cleveland Cavaliers in the 2008 NBA draft. He has previously played for the Cleveland Cavaliers, Sacramento Kings and Portland Trail Blazers, as well as in Israel for Bnei HaSharon during the 2011 NBA lockout. Darnell Edred Jackson is an American professional basketball player for Eisbären Bremerhaven of the German Basketball Bundesliga. He played college basketball for the University of Kansas for four seasons, including the 2008 national championship team. He did not become a regular starter at Kansas until the 2007–08 season, when he replaced Sasha Kaun in the starting lineup. The 2005–06 Cleveland Cavaliers season was the 36th season of NBA basketball in Cleveland, Ohio. The Cavaliers finished the season with a 50–32 record, and a second-place finish in the Central Division, returning to the playoffs since 1998. In the playoffs, the Cavaliers defeated the Washington Wizards in six games in the first round and reached the semi-finals of the Eastern Conference where they lost in seven games to the Detroit Pistons. LeBron James was the team's leading scorer and was named to the All-NBA first team. He was also selected to play in the 2006 NBA All-Star Game where he was the game's MVP. The Bulls–Cavaliers rivalry is a National Basketball Association (NBA) rivalry between the Cleveland Cavaliers and the Chicago Bulls. The teams have played each other since the Cavaliers joined the NBA as an expansion team in 1970, but the rivalry didn't begin in earnest until the Bulls drafted Michael Jordan with the third overall pick in 1984. After Jordan would go on to the Washington Wizards and eventually retire, the rivalry died down, but when Cleveland picked LeBron James with the first selection in 2003, the rivalry heated up again. However, the Cavaliers had an edge on the Bulls, who would pick Derrick Rose with the first selection in 2008 to turn Chicago from a lottery team, to a future contender. The 2018–19 Cleveland Cavaliers season was the 49th season of the franchise in the National Basketball Association (NBA). The Cavaliers entered the season as runners-up in the 2018 NBA Finals, in which they were swept by the Golden State Warriors in four games, the first Finals sweep since 2007, in which the Cavs were also swept, by the San Antonio Spurs. 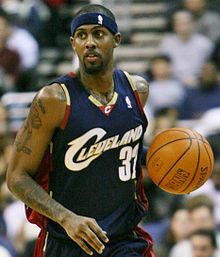 1 2 3 NBA.com : Larry Hughes Bio Page. National Basketball Association. ↑ "Cavaliers Reach Contract Agreements with Hughes, Ilgauskas and Marshall". NBA.com . August 2, 2005. Retrieved March 13, 2010. ↑ "Bulls acquire Gooden and Hughes in three-team trade". NBA.com . February 21, 2008. Archived from the original on March 6, 2008. Retrieved March 13, 2010. ↑ "Knicks Acquire Chris Wilcox & Larry Hughes". NBA.com . February 19, 2009. Retrieved March 13, 2010. ↑ "KINGS ACQUIRE CARL LANDRY, JOEY DORSEY AND LARRY HUGHES IN THREE-WAY TRADE WITH HOUSTON AND NEW YORK". NBA.com . February 18, 2010. Retrieved February 19, 2010. ↑ "Kings waive Hughes". NBA.com . February 23, 2010. Retrieved February 19, 2010. ↑ "Bobcats sign Larry Hughes". NBA.com . March 13, 2010. Archived from the original on March 19, 2010. Retrieved March 13, 2010. ↑ "Teams". big3.com. Retrieved May 12, 2017. ↑ "Former Billiken, NBA Player Larry Hughes Featured in New BIG3 League" . Retrieved May 12, 2017.